The brand new vintage of URBN VINO Central Otago Pinot Noir 2017 is now released. The 2016 Pinot Noir sold out months ago, so get in early for this wine. 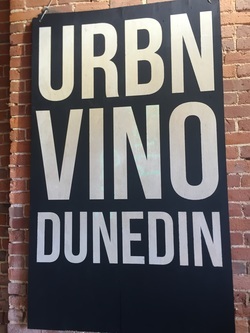 URBN VINO will continue to be at the brilliant Otago Farmers Market every Saturday morning at the Dunedin Railway Station throughout 2019. Come and see us up on the platform (look for the big sign) to try our latest releases of Riesling, Pinot Gris and Pinot Noir. The winery Cellar Door is also now re-open for retail wine sales from 1.30pm-5pm every Saturday afternoon in the Terminus Building, 42 Queens Gardens (behind Moiety restaurant and directly opposite the Dunedin Chinese Gardens). Tours and tastings are also available by appointment. In April and May 2016 I started the URBN VINO DUNEDIN project in a temporary location in an historic building undergoing restoration. I brought Central Otago grapes and winemaking equipment to Dunedin and made Pinot Noir right in the middle of one of the best small cities in the world (and in the middle of a building site). In March 2018, after a great deal of planning, the URBN VINO project finally came back to the city, this time for good. We returned with all the winemaking equipment and some grapes from Bendigo and Bannockburn and made wine in the city again. The wine will stay in barrel right here until bottling. URBN VINO has found a permanent home in the historic Terminus Building at 42 Queens Gardens. Check out our gallery to see how the winery has unfolded so far.